Reliable cars rental, cab service has been designed keeping your budget in mind. In pune it we provide best rates and offers a variety of pick-up and drop-off options to make your life easier. When travelling, go ahead with confidence in our taxi booking services in pune. Our cab service business goal is to offer our customers a variety of taxi hire service in pune and discounts at the very best price to suit our customers needs and get life long relationship with our customers. So they never feel to hire any other cab services in future. We offer luxury, semi luxury, Cabs suited for big family members, local travel, cab booking for long distance and more custom varieties to you depending on your preference. We always ensure your journey will be comfortable, convenient and safe. Customer satisfaction is our key value. We promise best prices always, covering more than 250 destinations in India. Our highly skilled and trusted car drivers trained to get your wish fulfilled by our cab booking service. Mineral water, Newspaper, Conditioned & clean cars, our cars are always in dependable so our customers never need to worry for car breakdown and continue stopless journey. Our taxi booking services has been known for efficiency and quality since long time. Pickup from Pune Airport or Railway station or City Location drive to Adlabs Imagica. 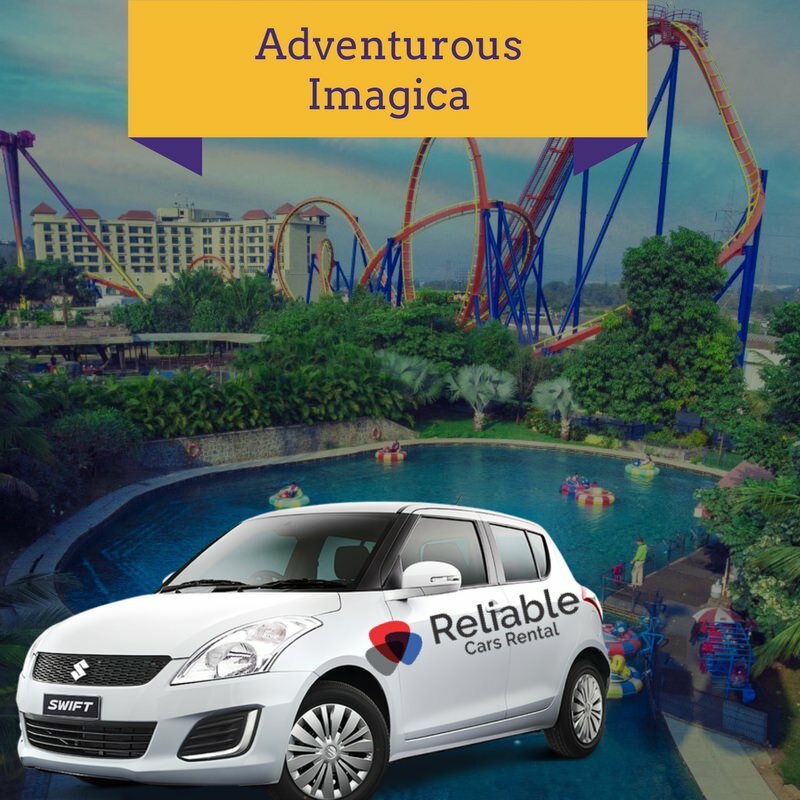 Adlabs Imagica is a theme park which is situated in khopoli,India.They have different rides for different age groups. Guests can bump into the in-house characters of Tubbby – The Elephant, Roberto – The Star Chef, The Lost Astronaut, Mogambo of Mr. India fame and The Gingerbread Man while hopping from one ride to another. Nitro The Nitro is a roller coaster, with a height of over 132 ft and track length of 2800 ft. The Nitro travels at 120kmph and visitors experience a G force rating of 3.8 Gs during the 150 seconds of this ride. Dare 2 Drop : Dare 2 Drop shoots riders up to a height of over 132 feet at 73kmph against gravity and drops down, at similar speeds. This motion gives the riders a sense of weightlessness for about a fraction of a second on the ride. I for India : The ‘I for India’ is an indoor ride on a 90-foot wide screen. The journey spans across 6182 miles, covering 59 monuments. Mr. India : Mr. India is a ride based on the 1987 Bollywood film“Mr.India, starring Anil Kapoor. The ride in itself imitates the experience of other rides in the park like the Scream Machine, D2, Nitro, Salimgarh, Alibaba, and Rajasauras. The ride is operated by a pneumatic system powered by compressed air. Rajasaurus River Adventure : The ride begins with a voice-guided boat tour of various dinosaurs inside a vast enclosure that is styled with pre historic elements. Salimgarh : A slow moving coaster navigates the visitors through the ride letting them experience the story of the fictitious town of Salimgarh through frightening visuals and scary sound effects. Alibaba aur Chalis Chorr : This ride is designed to give the visitors a feeling of being inside a video game. The theme of the ride is inspired by the classic story- Alibaba and the 40 thieves. Wrath of the Gods : This is an indoor attraction that blends live mechanical theatrics, special effects and multimedia. Humpty’s Fall : Humptys Fall is a kids’ ride. It is a mini drop ride inspired by the D2.